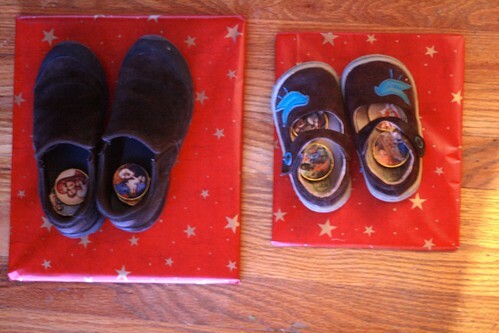 Here is a post I wrote a couple of days ago and just didn't get the chance to publish, thoughts about celebrations, in honor of St. Nicholas Day. Excuse the photos. Every year, my children wake up a bit earlier than the previous year, and this year there was nearly no daylight at all. I miss the days when they woke up at 8:00(!) every day! When Elisabeth was born, we were the only people we knew who observed St. Nicholas Day, at least beyond a cursory nod and some candy in the shoes at Sunday school. So we made it our own, in a simple, special way. 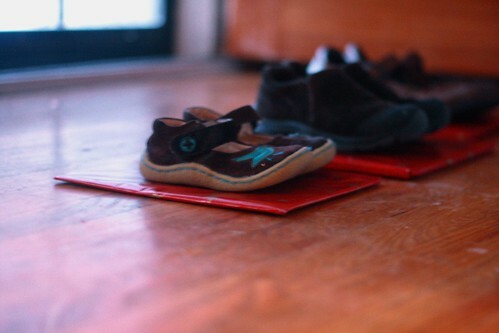 I've realized over time how important keeping things very, very simple is for my children, and for my own sanity. I think it's easy for parents to want to go all-out with everything, including lavish celebrations of every major and minor holiday. The risk with making every event more extraordinary than the last is, of course, burning out -- and missing the opportunity to experience something truly meaningful. So, St. Nicholas Day doesn't have to rival Christmas in terms of gifts and traditions and amazement. You don't have to use special shoes, or fill them with lots of gifts, several varieties of fruit and nuts, and lots of different decorations. My children love the predictability of our small celebration; we've been doing it the same way all their lives and they love that. 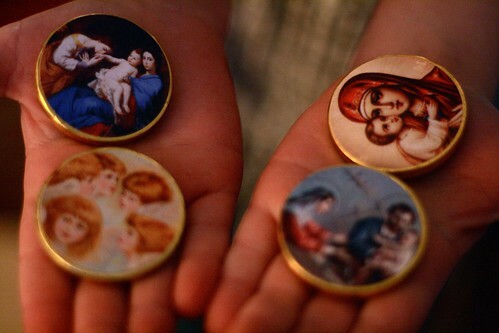 There is one gift (a new nativity-themed Christmas book) for each of them, and chocolate coins in their shoes. And there is plenty of wonder and delight and excitement and joy. Last weekend, as our Advent stockings were getting underway and I was laying in bed with stomach flu, I was reminded again of the advice I have shared with so many other mothers: Could you do it if you were sick? If your child were sick? If you were traveling, or if you had house guests? Could you do it if you moved to another state, or another country? Would you want to? Traditions change and evolve, and sometimes you find that they go away without much fanfare at all. Certainly the answer to each of these questions doesn't have to be "yes" before deciding to begin something new (or no one would ever begin a new tradition). But they are good things to ponder. I really believe that when we keep things simple, when we really get down to the heart of why we do them, then they become a part of us, not a burden. And that is exactly the kind of celebration I hope for -- for our family, for each of my children as they grow into adults, and for my own soul, too.